9 new RFsTomo1 receiver stations (KIR,IVA,SOD, KUU,OUL,VES,KAU, NUR and JOM) in operation. Ionospheric Tomography Chain has been in operation since November 2002. 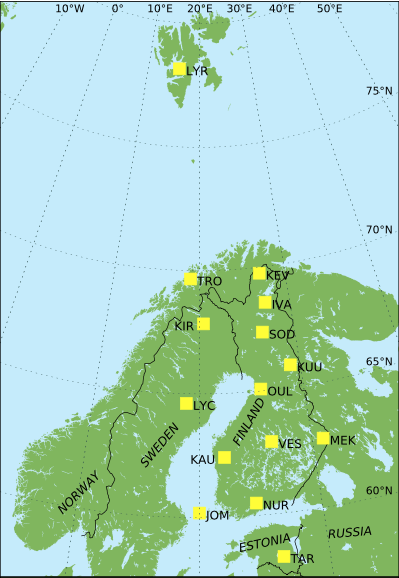 The five receivers of SGO have been in Kilpisjärvi (Feb 2004-2013) and Kokkola (Finland) 2002-, Luleå 2002-2014 and Kiruna (Sweden), 2002-. Tromsø (Norway) 2002-2004 moved to Kilpisjärvi in 2004. During the year 2017 old receivers are replaced by RFsTomo1 receivers and partly relocated. Campaign base ionospheric tomography measurements combined with the Finnish EISCAT Campaigns have been done since 1995. During past years FMI has built up TomoScand receiver network. SGO receivers are upgraded in RLab project funded by European Union's European Regional Development Fund. First of the ten new receiver produced by (RLab project / RF-Shamaanit Oy) was installed to Kiruna in 1 June 2017 and alltogether 9 receivers were in operation in autumn 2017. More about new receivers, see our poster in 14th European SpaceWeather Week: New Space Weather Instrumentation in Support of EISCAT_3D Since late 2017 two receiver networks (SGO an FMI) form joint FMI-SGO TomoScand network. Receiver network of Joint FMI-SGO Tomoscand network. Last modified: 19 April 2018, 14:18:15.